Wondering what your business needs to attract customers on the move? Following the advice of three retailers in the auto, recreational vehicle (RV) and marine category, Hardware Retailing has compiled this checklist for “must-have” products to keep these consumers supplied and ready to ride. This can appear obvious to stock these standard consumables in all of the varieties necessary for different engines. Yet these products form the cornerstone for another market in the auto industry: supplying mechanics and auto repair shops. If you stock the consumables these businesses go through on a daily basis, and can beat other suppliers’ prices, there’s plenty of business to be gained. Whether they’re sold as full kits or individual products, a stocked emergency kit should be in every vehicle. Reflective markers, jumper cables, emergency lighting and tire gauges are some of these standard items. Replacements for items that usually come with vehicles, like tire jacks and lug wrenches, are also necessary. Cold-weather locations should also have a selection of ice scrapers, tow cables and other emergency items that can help a motorist recover from a slide off. The options for auto cleaning supplies are vast, but there are staples that any retailer looking to upgrade their auto department should stock. Vacuum cleaners will always be necessary for auto cleaning purposes, and they range from full wet-dry vacuums to simple cordless, handheld options. No-scratch, highly absorbent towels for exterior work are key, as is auto detailing clay. The clay kits help get a vehicle truly clean before applying more standard soaps and treatments to a car’s exterior. RV owners are all about the comforts of home. Their homes just happen to be transportable to whatever locale they wish to visit. Camping sites often go hand-in-hand with heavy RV traffic, and there is plenty of crossover in products between the two. However, make sure to feature more high-end products for the RV crowd. These include outdoor chairs, tables, dining sets, lighting options and even outdoor carpeting. Both RVers and campers enjoy using their outdoor space, but unlike campers, RVers can accommodate heavier and more comfortable options. Much like the auto department, there are multiple product lines that can fulfill the RV cleaning market. 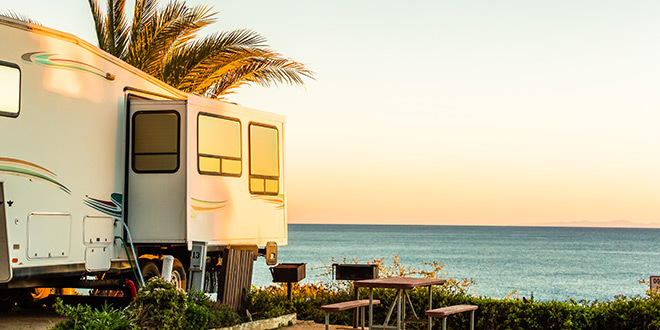 However, there are two things you should keep in mind when catering to RV owners: These vehicles are usually treated well (given their large cost) and some items are specialized for RVs. Expandable brushes to reach taller parts of the RV, awning cleaners for an owner’s outdoor cover and high-powered hose nozzles are some of the items you should make sure to have on hand. Some things are constant realities for RV travelers. One is bathroom sanitation, another is space availability. When you are moving your home from one great vista to another, you’re bringing everything, including your toilet, along with you. So, bathroom chemicals and cleaners are a must to keep a mobile home fresh. Chemicals that control odor from black water tanks are a must, as are chemicals, in both liquid and tablet form, to help break down waste. Also, since most RV toilets are plastic, special cleaners are needed that won’t erode connection points or the bowl are required. As for space issues, collapsible bowls and kitchen accessories that allow stacking are key for your customers to fit everything they need in a tight area. Shelving that can stick to the inside surfaces of cabinets also add space where every inch is needed. Cooking options that can fulfill multiple roles, like a slow cooker that can also heat up to sauté foods, help keep the number of appliances down. Boats are built for fun, but the dangers of open water demand certain safety precautions. You need to have these products on hand for your customers as they prepare to leave the friendly shores. Life jackets, flares, anchors, lines, navigation lights and electronic navigation items are all required by law in most areas. Keep the items on hand and have staff available that know the area’s requirements for safe boating. Smaller items, like instrument panel lights, can also be a safety issue if they burn out and cannot display the proper function. An expensive but possibly lifesaving item is an EPIRB (emergency position indicating radio beacon), which can automatically alert emergency responders if a boat finds trouble on the water. Batteries are often the lifeblood of a boat, keeping the electronics vital to safe and fun boating powered and at the ready. Batteries range in type (starter, or cranking, batteries; deep-cycle; and dual-purpose) as well composition. The requirements of each boat vary, so the best option is to carry, or have available through special order, a wide array of battery options. Also, if your staff has the knowledge and expertise available, offering repair services for commonly troublesome products like battery lines can be a big timesaver for your customers and a great attraction for your business. You shouldn’t forget how much fun it can be to set sail. Whether designed for a quick fishing trip or to take on open ocean, boats are often an escape for their owners and passengers. Once you’ve made sure your customers will be safe on the water, and they have everything to get from waypoint to waypoint, make sure to supply the fun stuff as well. Cushions that can stand up to sunlight and water make topside areas more appealing, as do tarps or awnings if a boat doesn’t come with sun protection built in on the upper deck. Given the self-sufficiency needed at sea, small solar panels and batteries that can receive their charge are great items for boaters, helping keep small electronics like phones, speakers and tablets powered. Since water and electronics don’t always go well together, water-proof cellphone bags are great options to ensure equipment safety, while dry bags can keep larger items out of harm’s way.